I just got an email from The March of Dimes reminding me that this Saturday is World Prematurity Day. November is also Prematurity Awareness Month. To me, every November these reminders hit closer to home than I would like them to. Five years ago, I went into labor completely unexpectedly at 26 weeks. I had a sort of bad feeling that morning, but I figured I was being paranoid, so I went on to work. Finally, I started asking questions to the other girls that I worked with about my symptoms. I called my OB and was assured that everything would be fine as long as I wasn’t bleeding or in pain, which I wasn’t. After being at work for over seven hours on my feet, at the urging of one of my co-workers (who to this day I am SO VERY thankful to), I went on the the doctor just in case. He was checking everything out and I had my eyes fixed intently on his face as I saw his expression change to fright. He started talking fast and making phone calls while telling me that I was dilated to 2 cm and the bag of water was coming out. That was the last thing I thought I was going to hear. When I left work, I told my boss that I thought it was nothing and I would be back in a few minutes. I just wanted to be sure. When I saw the urgency of the situation, I started to cry. My husband was out of town working and I felt so scared and alone. I thought I was losing my baby. The doctor actually yelled at me and told me to stop crying or my water would break. Oh, how hard that was to do. He continued to make arrangements for me to be taken to another town with a hospital well equipped to handle such cases. I was told to drive to our local hospital which was only right across the street. I was so scared to get up and walk, let alone drive. I walked into the hospital and how I got to wherever I went, I have no clue. I called work to let them know I would not be back. My dear and wonderful friend who worked in an office connected to the hospital heard my problem and she was there right away. She stayed with me until the ambulance drove me away. I really don’t know if she realizes how much that helped me. In the local hospital they started me on very high doses of magnesium sulfate by IV. It was horrible. I was so miserable. After what seemed like forever, the ambulance drivers and a nurse came and drove me to what would be my home for the next 24 days. By the time I got there, I was delirious. The magnesium was really starting to kick in. I would have never thought magnesium would have such an effect on you. It was worse than the flu. I had a terrible headache and my whole body was in pain. I wanted to die. I am not really clear on what exactly happened in the next 2-3 days. All kinds of people were coming to visit. I was so happy to see several of my work mates drive so far just to come see me. I have pictures that I am so thankful for. It was a completely miserable time. I was in major shock. I was not at all prepared for anything like this to happen. I had been around so many women who worked right up until their due date without a problem. When I read my pregnancy books, I skipped the preterm labor parts because I knew it wouldn’t happen to me. I thought that was only for people who didn’t take care of themselves. I didn’t know a healthy person carrying one baby was even at risk for such a thing. Well, I am here to tell you that it doesn’t matter if you don’t smoke or drink or do drugs. It doesn’t matter if you quit caffeine and start eating nothing but healthy food. A perfectly healthy mom can give birth way before her due date. Those weeks in the hospital really humbled me. I was not allowed to get out of my bed. I had to let strangers bathe me. My cousin shaved my legs. I held my poop for 3 days for fear that I would give birth while doing the deed. When I finally had to go, it was the middle of the night and they brought me a potty chair and placed it right beside the pull out couch where my sweet cousin Melissa was trying to sleep. I had a catheter for most of the time I was in there and the thought of people seeing my pee hanging off the bed in a bag was just more than I could handle. All in all, it was horrible. But, it made me into a different person. I think a better person. I have much less shame than I had before, and for that I am grateful. Don’t get me wrong. I don’t let people I don’t know bathe me anymore, and I definitely don’t poop out in the open (although I probably could if I had too.) I am just saying, I am much more open about things now. Not everything is so private. It makes life a little more comfortable when you have no secrets. I will always be grateful for my wonderful family and friends who were there by my side throughout the whole thing. They made sure that I was never alone. They brought me food, new pillows, and even got me hooked up with a refrigerator in my room. I got chocolate and p.j.’s and movies. People were massaging my legs and feet. My toenails were painted all sorts of colors. I couldn’t have asked for better care. After those weeks in the hospital, I pretty much knew the day before Wes was born that it was time. At that point, I made it to 29 weeks. It was the first day that I had been left alone by myself. I kept having contractions. I told the nurses. I was afraid to tell anybody else. That night my water broke and it was clear what was next. The doctor induced me at 8:00 am and after a few not very painful contractions and a lot of sitting and waiting, my boy was born at 1:16 Tuesday November 20, 2007. He weighed 2 lb 12 oz and was 16 inches long. His due date was February 6, 2008. The doctor told me before he was born that I wouldn’t be able to hold him; they would have to take him straight to the NICU. To my surprise, and I am sure a lot of others, he was breathing on his own! The doctor slapped him down across the top of my left leg and told me to hold on to him. I was so scared that I was going to drop him. Brad and the doctor were over cutting the cord and there I lay so dizzy from whatever I just done, holding the smallest human I had ever seen in person. Well, I wasn’t holding him up to my chest like the movies..or in real life.. I was holding him so he wouldn’t fall off of my upper leg. They took him and weighed him and did the APGAR test which he scored pretty well on for being a little guy. By the way, in my delivery room, there was a team of about 15-16 people prepared for every scenario. That took me by surprise just like the rest of it. So, the good news was that they wrapped my “Baby Boy Arnett” up in a blanket and let me hold him for 30 seconds before they whisked him away to the NICU. I am sure they must have known what good that did me or they wouldn’t have done it. I didn’t expect it at all. It was such a wonderful moment. Wesley was in the NICU for 8 weeks. That could be a whole story in itself. He couldn’t nurse, so I pumped the whole 8 weeks he was in there so that he could have the best food that was made for him. So many things happened in those weeks. The NICU is a blessing and a nightmare wrapped into one. I have still not recovered from the whole ordeal. I don’t think I ever will. I suppose it isn’t a bad thing. When terrible things happen and you make it through them, you become a better and stronger person. Wesley was born right smack in the middle of Prematurity Awareness Month. This month is a very emotional one for me. So many memories. We have had a few set backs, but for a 29 weeker, he has really done well. I am very proud of my little boy who will be five in a few short days. Here is Wesley at about 2 days old. My first real time holding him. It has been a relatively rough week in the Arnett household. In some ways it has also been good. Wesley took his last dose of steroids on Saturday, and so far our daily urine tests are coming back perfect. But as I just mentioned, it has just been a really “off” kind of week for all of us. Brad and I had some kind of food poisoning/stomach bug late last week and it really took a toll on the old energy levels. The weekend was packed with more social interaction than I could handle. Then, I did my regular Monday babysitting and the baby just really wanted me to hold him in all constancy all day long. Not to mention my own child and his infinite need for food and me. Whew, I almost didn’t make it through that day, but in fact I did. Then, Tuesday came waking me up for more. We just purchased a new HVAC after all summer of suffering in the extreme heat. Our previous A/C had a freon leak in a bad spot and it was just too expensive to repair. Also, our gas furnace quit working when the previous owners lived here, so we have always relied on baseboard heating during the winter. These things all added up to the fact that the best option was to dish out the cash and get an entirely new unit. They came over Tuesday to begin working on taking out the old unit. They found lots of things that should have been included in the bid, but were overlooked. But, thankfully to my benefit, the agreement was signed and I had already paid in full, so it was their loss. Wesley quickly made friends with one of the guys. He pulled up a chair and talked the man’s ears off. The guy, probably out of a need to calm his nerves, finally lit a cigarette. Oh, MY! My child was ALL over that. He asked the man, “Don’t you know that smoking is bad? Do you know who Jehovah is?” Then, Wesley promptly went and got the computer and put in a DVD to teach the man about God! Well, I was a proud Mamma for sure. My kid was standing up for what is right, even if he was jabbering up a storm and driving this strange man that he didn’t know absolutely bonkers. But you see, it was keeping him busy, so I was able to get a lot a cleaning done. It was a win-win. The man informed Wesley that he knew smoking was bad and he was going to stop. Then an hour later, he lit up again. Wes didn’t miss a beat. “You said you were going to stop smoking.” This went on for two days. A couple of men lingered around my house Tuesday and Wednesday and made some messes (which I am very accustomed to anyway), but ultimately, it was worth it because I have complete control over my indoor temperature now! These were the highlights of the week. Now for the bad part. Yesterday I let Wes skip his home school. 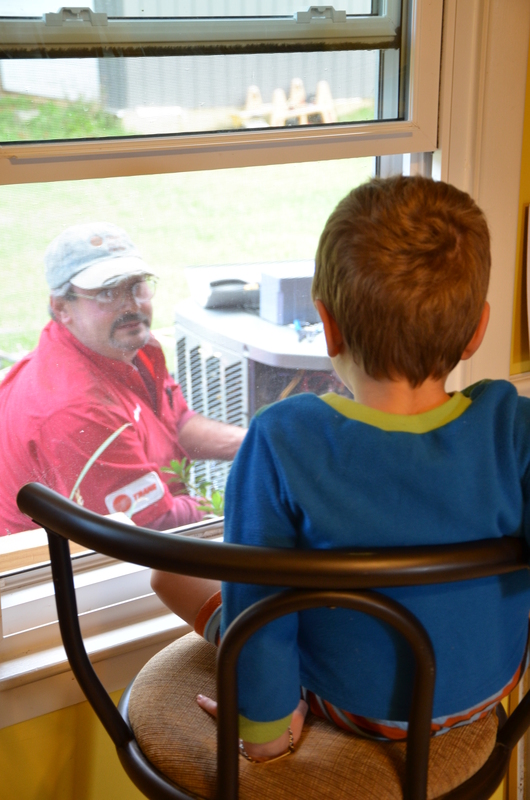 There was a lot going on at the house and besides, he was getting fully educated about HVAC installation. That could help in the future, right? But, today, it was a different story. I started off the school day a little too late. I was really procrastinating trying to get some things done around the house (which didn’t really happen anyway). Then there were the regular multiple phone calls. Finally about 11:30 we sat down to begin our schooling. It started off great. We discussed how each member of our family is important in different ways. We talked about the things that Wesley does to help out around the house. He is in charge of feeding the cats. He helps me fold the washcloths when I do the towels, he is getting to be super good about keeping his room immaculately clean. Things like that. Then Brad came home for lunch in the middle of learning right and left, and the trouble began. I had to stop and wash Brad’s window cleaning rags. More phone calls. Lots of interruptions. So come time to get back down to business and the boy was done. He spilled apple juice all over my freshly mopped floor. That was about all I could take. I even yelled. I even spanked. I even made him stand on one foot in the corner. It was bad. Not just that he spilled the apple juice, but the way he was acting. This was a day that I wished that my little boy was at school, right now. How could I think such a thought? What if he got sick a bunch of times and had multiple relapses and had to go back on the dreaded medicines? I would feel so guilty for ever thinking such a thought. Was I feeling this way because I am at my wit’s end, or is this the normal reaction of a parent of a child with such delicate health? But you know, I am never alone. I don’t even get to shave my legs without interruption. Ever. Sometimes, that may drive a person to think such thoughts. Can I really handle this home school business? I suppose only time will tell. Maybe if Brad would just take him to Lowe’s with him on occasion and let me be by myself for an hour. Would that make me a little less crazy? Speaking of crazy, maybe that is the problem. Mid-Summer, I decided that I was only half as crazy as my doctor thinks I am. So I started cutting my anti-depressant in half. I actually have felt WAY better and have lots more energy after doing that. But maybe that other half of craziness is sneaking back up on me. Well, after this long, energy draining, emotionally tiring day, I had to make my way to the grocery, boy in tow. It took the rest of the life out of me. I came home, put the groceries away and started to feel sick at my stomach again. Very much like I did last week. I thought I was going to vomit, but instead it came out the other end. So there I was, on the toilet, trying to poop/stop pooping, catching up on my Better Homes and Gardens mag and dreaming that my home could become one of those perfect homes in there, and wishing that I had perfect crafting skills and, and, and here comes Wesley holding two kittens in his hands. One was squirming and complaining an awful lot. As I was trying to tell Wes to put them back in their bed, one kitten starting pooping. Right there in mid-air. Right there with Wesley holding it over my lap while I sat on the toilet. O-M-GOODNESS. I yelled for Brad, but he was napping on the couch. He was not the least concerned about the situation. I took the kitten and let it’s tiny turd land on a page in my magazine. It was so symbolic of the way I felt. My big dreams, always being pooped on. I finished my business, and me and the kitten went straight in the shower. Poor little guy is only four weeks old. But I cleaned him all up and blow dried his little fur until he was back to normal. So do you see my point? I can’t get any minutes alone. Not even minutes that should be mine. The time that I am not alone, which is all the time, is filled with multiple levels of various disasters. I feel so overstimulated all the time. I just want to take a giant nap and sleep everything away. I sure hope I can keep up the home schooling. I am definitely starting to have serious doubts. But, hey, that is what this year is for. It is simply an experiment to let me know if I can do this or not. He isn’t required to go to school technically until year after next. But I will make my decision and he will be doing something, be it at home or in public school next year for sure. Maybe it’s just been a bad week. Who knows. 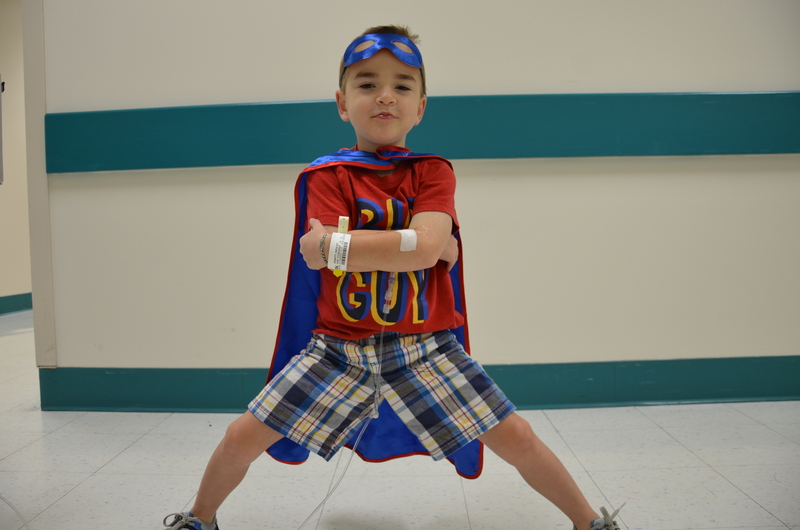 As most already know, last Tuesday Wesley’s nephrologist gave us to OK to “be as normal as possible”. That means we can go places! First thing he wanted to do was go to Cracker Barrel and get sausage… and that, we did. I am still leery of germs and large crowds of people. All kinds of bugs are floating around out there, my child can’t be vaccinated (if he could I don’t know that I would do it at this point), and of course he is still very immunocompromised. At a few places I have made him wear a mask, but mostly we just squirt on the hand sanitizer and hope for the best. A few weeks ago, I helped Wesley clean his disaster of a room. He now has a place for everything. (He had that before but never realized it) I told him if he could keep everything in it’s place for a week, I would buy him the toy that he has had his eyes on for a while. He took that job very seriously. 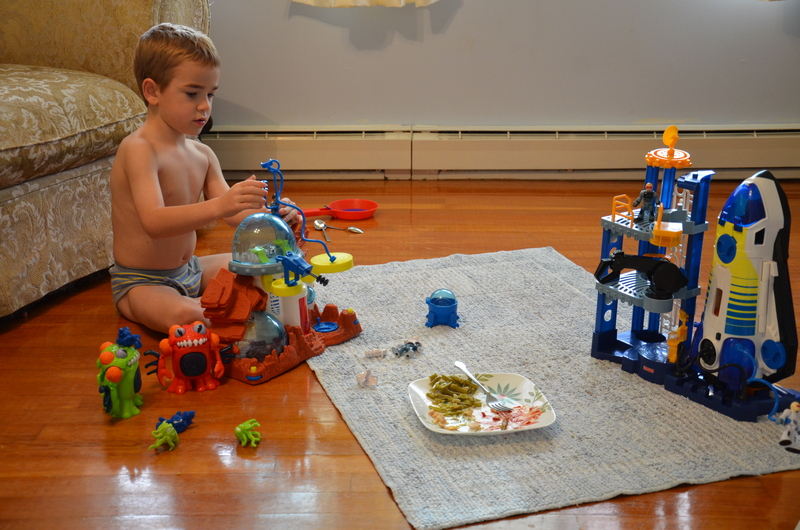 His friends came over and he flipped his lid every time they played with something. He wanted things back where they belonged before the kids had a chance to look at them. When Brad came home, I was telling him about it. We went into Wesley’s room and we were all sitting on the floor. Brad tested him by putting occasional cars in the wrong place and you better bet, the boy was right on top of that. Since he did such an excellent job, I ordered his toys that he wanted and boy was he excited to get them! It is a bunch of space stuff, aliens and all. He plays with them every day. That was time and money well spent. So now with our broadening knowledge of all things space, and our new freedom to be in public places, I have decided to take Wesley to the Hummel Planetarium tomorrow. We are going with friends that are also being home schooled. The show we are watching is called “The Secret of The Cardboard Rocket”. It is about two little kids who turn a box into a rocket and fly to space. It teaches about all the planets in our solar system and why our earth is such a special place. Wes is way excited and so am I.
I am hoping for no sick bugs and a happy winter. Last dose of steroids is Sunday. I hope it sticks this time. At work today, I finally got the call. Blood work says all CD19’s are wiped out! Wesley doesn’t have to get anymore infusions until he relapses. That should be atleast 6-8 months. We will be finished with the evil steroids on October 6th and hopefully we will have a drug free winter! This will be his first good break from the steroids Since April 2011. PLEASE stay FAR away from us if you are sick! Wesley got to go to Cumberland Falls today with Brad, Annie, Papa John and two lovely friends from England. While I was at work, it was hard not to worry about Wesley’s well being. I am so crazy. I was worried because: 1. He was traveling. 2. He was traveling far from me. 3. GERMS 4. Cliffs, rocks, water and other natural dangers. 5. Mosquitos/West Nile. And thanks to my informative co-workers 6. Bubonic Plague and Hantavirus. I called Brad twice to remind him to apply the all natural bug spray thick. So much easier now not to complain about that $1.50 parking fee today. My boy is done with the needles for a while. He will be off steroids in less than a month. The weather is about to get cooler which means more outside time for us. For these things, I am so thankful. 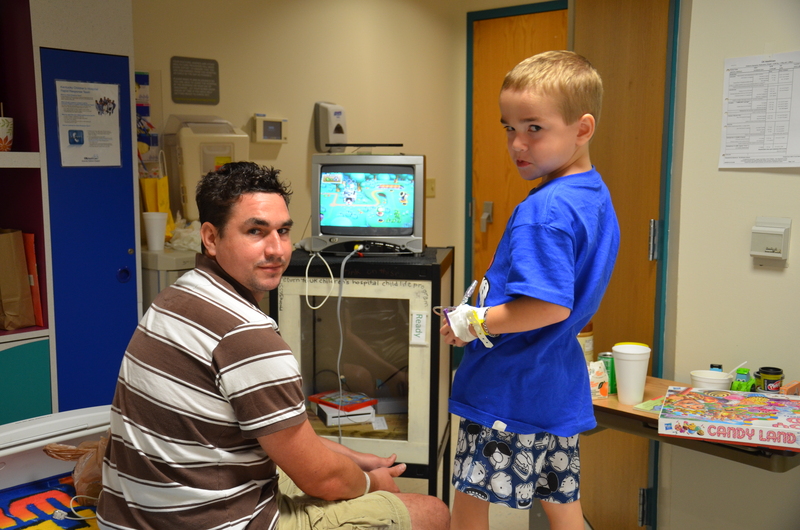 Wes had to get his blood work yesterday so that we know if he needs to continue with more infusions or not. We should have results by tomorrow or Friday. We had to drive all the way to Lexington to have it done. I suppose it can’t be done locally because of the specifics involved. It should have only taken about 15 minutes. I went down the hall to get the orders from his doctor, then back down the hall to the lab. The lab was packed as usual, filled with all sorts and ages of people who I am sure have plenty of germs to share. 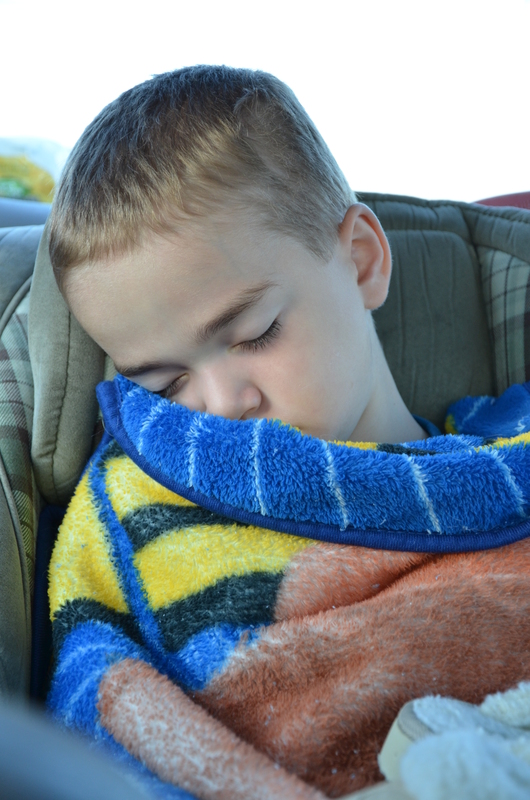 Normally, the lab manager takes us back right away and gets us out fast because of Wesley’s compromised immune system. She wasn’t there yesterday, and neither were all the rest of the phlebotomists but two! I made it clear when I came in that my son is not even allowed to be in public and we needed to be put in a room by ourselves and he should be top priority. They put us in our own room, which didn’t really stop my worry a whole lot, but made it a little more bearable. Forty-five minutes passed and we were still in there. I went out and reminded the chick behind the counter how serious it was to get us out. She was not compassionate at all. Urgh! I went back into our room and waited some more. It must sound strange to some people who don’t have to worry about germs. Most don’t have to worry. Well, I do. My kid could get an infection and get very sick. He could end up being hospitalized or even die. His immune system can’t fight stuff off like a normal person’s. So there we sat, playing games on the phone and doing everything possible to keep his hands off anything in that room. Forty-five minutes passed again. I was livid. I knew that if I went back out there to the front desk that I would loose it and just make them mad. So, I called his nephrologist office. I told the receptionist the situation and it wasn’t five minutes later they came in, took his blood and we left. We have to pay to park in the parking garage that belongs to the clinic. I think we have given them enough money in the past year and a half to do a remodel! 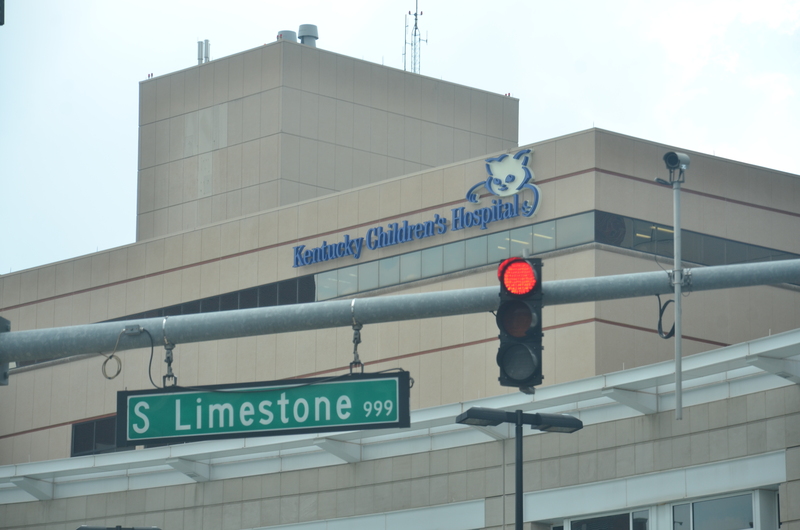 It may sound cheap to complain about such a small thing, but I drove all the way to Lexington just to have blood drawn and the procedure should have been super fast. It wasn’t my fault that they were short on staff. So instead of paying for under an hour, which is only 75 cents, I had to pay for 2 hours, which was $1.50. The poor lady at the little garage stand got her dollar fifty plus a mouth full from me. She then proceeded to tell me to call administration and complain to them. Yes, I know it wasn’t her fault that I was out an extra 75 cents, she just works there. I am sure she gets that all the time, which is why she was so nice and respectful to such a wacko crazy person like me. After all that exposure to every germ imaginable, it didn’t seem like a big deal to slap a mask on the boy and run into Clothes Mentor to try and sell my old maternity clothes. I know that it takes a while and you have to wait until they get to your clothes, so I told the girl I could wait in the car until they got to mine. I asked how long, she said 20 minutes. Me and Wes went to the car to spend our 20 minutes. He ate his chicken by standing through the sunroof and using the roof as his table. Yes, I allowed that. No, I don’t know why. We did a few more things to pass the time, then went back in. There were several girls behind the counter pretending to be working. The one who initially took my clothing saw me come in and said that my basket was all ready and I could go the the register to cash out. Those words lead me to believe that I was going to sell some clothes. I proceeded to stand in line behind several people at the one cash register that was in use. We waited and waited, and once again, I was doubting that we should even be in there. Wes had his mask on and it wasn’t that packed, and besides, I was about to get some money, right? When finally I was next, I was informed that my clothes were not up to their standards. I argued and said they looked perfectly fine to me, which of course did no good. Man, my day wasn’t going well. I have never seen so many stuck up people selling used clothes at once. Why didn’t that lazy girl who went through my clothes just hand them back to me instead of making me stand in line and wait to get nothing? It got a little better. My granny came with us and we had dropped her off at the mall so she could get her shopping fix while we did our thing. We went to pick her up and she let me run in real fast so I could make a quick shopping trip that I never get to do. I found an awesome pair of shoes and with my coupon, they were only $9.40! I just hope I can walk in them. Then I ran down to Gymboree and got the boy some much needed underwear. These steroids are giving him an unrelenting appetite which is causing him to grow up a storm. So, that was my day in a nutshell. This weekend, I am having a yard sale at my Granny’s house. I hope I can sell my unworthy maternity clothes there. I have gone through Wesley’s closet and there is nothing left that is too small! Feels so good to get it out of the house. Now to sell it! Wesley is going to have a lemonade stand. He will probably make more money than me. Oh, well. Come by and see us if you are around! 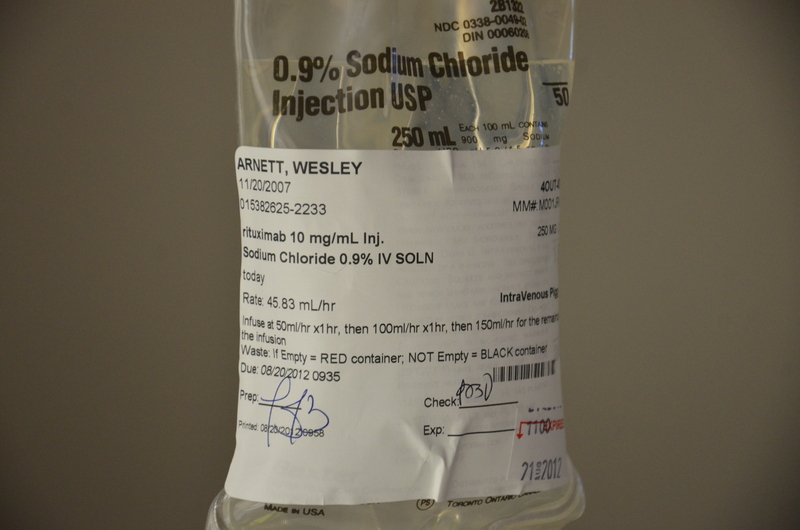 First, to update those who don’t know about Wesley’s infusion yesterday. He had yet again zero reactions. Hurray! It went well except for the part when he didn’t want to get Charlie back in his veins (His IV’s name is Charlie) He has always done good with things like this. When he was younger, he was very brave and never even cried. As time has gone on and needles have become a much larger part of his life, he always likes to make a little “show” to let us know that he is unhappy. My hypothesis for this is in an earlier post. Now, there are usually always tears and begs and “no’s”. Well, yesterday it was all crazy. Brad just left the room to go to the car and get some info for his work. That left me and Wes with each other to deal with Charlie. Again, normally not a big problem. Just some tears and protests and and we are done. Not yesterday. He threw A FIT. He was struggling with all his might to get away. I tried every trick I knew and nothing helped. There he was with two choices before him. He could either calm down and let me help him like always, or he had to be wrapped in a sheet. Personally, I hate the sheet. It seems so mean. But we had to do something. I talked to him as calmly as possible and explained the options. We ended up tying the little guy in a sheet. OH THE HORROR! He was so mad that he didn’t even want his complementary after shot toy! He shunned everyone around him for two hours. People would talk to him and he just looked to the sky in the opposite direction as if he were the only one in the room. He is normally super talkative to the nurses, but not after that ordeal. The boy can definitely hold a grudge… and he does not get that from my side of the family! As time went on, things got better for him. He ate A LOT. Like two days worth of food in a few hours. Steroids, I am sure, are the cause of this. He was also very drugged from the Benadryl, so it was like he was in this weird daze uncontrollably eating mass amounts of food. Thankfully, I brought along lots of healthy stuff. Then, our friend and his little girl showed up for a visit. Their baby boy is in the NICU right down the hall from us, so they are regulars at the hospital right now too. At first, Wes was ignoring his best bud Melea. That was when he made his turning point from grudge holding to being a better boy. Anytime a pretty little girl shows up, his behavior gets better. Next, the clown came by. That was quite the experience. Poor Brad got drawn into his silly acts. 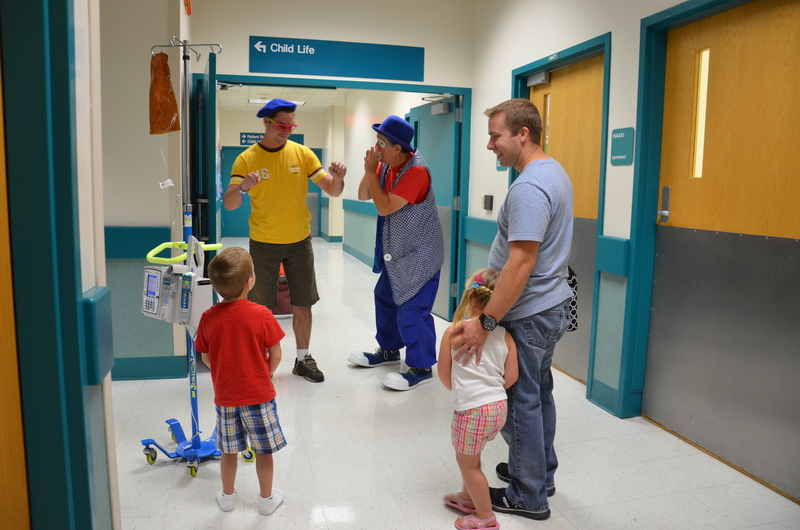 The clown made Brad dress up and dance for us… All in front of his best guy friend. How embarrassing. He handled it very well. After that, everything was much better. Wes put on his new super hero outfit that my dear friend got him.. 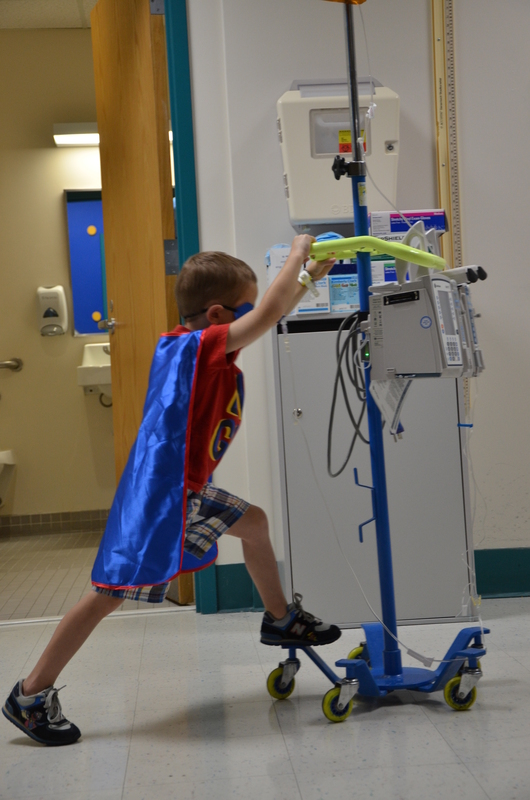 He was skating down the halls on his IV pole like Super Man. The next step is heading back up sometime before Monday to get blood work to see if all the CD19 antigens are wiped out. If so, we are done for a while. If not, we are in for two more Mondays. Getting up at 6:00 am every Monday driving to Lexington is getting old fast. The house is quickly becoming a hazmat zone. Admittedly, I am not the best house keeper to begin with. I loose focus easily while I clean… or do anything else for that matter. I have been told by certain people that I have the attention span of a goldfish. It is so hard to keep going when right behind you there is a little boy undoing what was just done. I have been watching Hoarders on Netflix before I go to bed at night. It has become a huge inspiration for me to purge my house of all things not useful or super sentimental. But, I watch it, go to bed and wake up to do daily chores, then the big stuff gets left undone. Today, my most wonderful Granny came by to help me. We got SO much done. If you walked into my house this second, you wouldn’t even know that we did anything. But look under the stove, open the fridge, look inside the cabinets.. That is where we did all the work today. I got rid of pots and pans and plastic ware that has just been sitting there. I threw away all the moldy stuff from the fridge and scrubbed the whole thing inside and out. I cleaned out Wesley’s closet and the only thing left is clothes that fit him! We worked hard, but if feels so good to be free of a lot of stuff that is no longer in use or needed. I have much more to do… Still gotta go through Wesley’s three drawers of pajamas. (Have I mentioned that I have a kid pajama obsession?) There are things in there that he hasn’t worn in two years. My closet will take days. I really don’t want to tackle that, but I definitely can’t wear 0’s and 1’s or 2’s, 3’s or 4’s… and many other sizes for that matter. What is the point in keeping it? This deep cleaning business has been a long time coming. I am so glad my Granny was here to inspire and help me to keep going! It’s so nice to not feel like I am walking through an episode of Hoarders. My house lost about 400 pounds today! Hopefully I will keep the motivation up and finish! We are having a yard sale not this Saturday but next. Can’t wait to get rid of things taking up space in my house and my life and get some much needed cash! How do you keep the clutter down in your house? Dr Kiessling of course had just been in ten minutes before we got there. So we had to wait for him to come back. He had other patients on the floor so it wasn’t a huge problem. We again talked about the side effects and what we should be watching for during the infusion. He would be in clinic all day, but the clinic is connected to the hospital and I made sure he had his running shoes on just in case we needed him. He reassured me that he did. There were two residents who were right there constantly if we had a problem, and if it got serious, Dr Kiessling would be there fast. 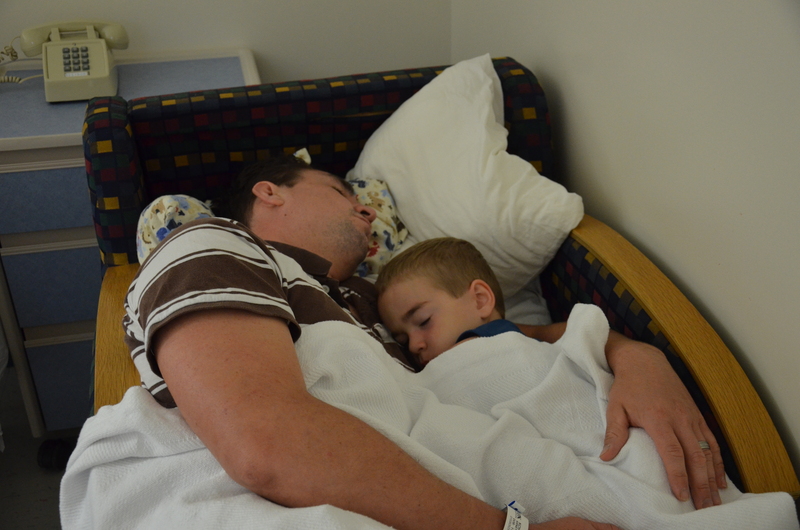 While we waited for the meds to come up from the pharmacy, we tried to get comfortable in the room. Poor Brad just wanted to sleep.. and so did Wes… and so did I, but how could I sleep at a time like that?! So, I just took pictures. I had all the presents ready and put them up on a shelf. Wesley wanted to open them as soon as we got there. I let him pick one out to open. He ripped the paper off and found a Mario shirt inside. 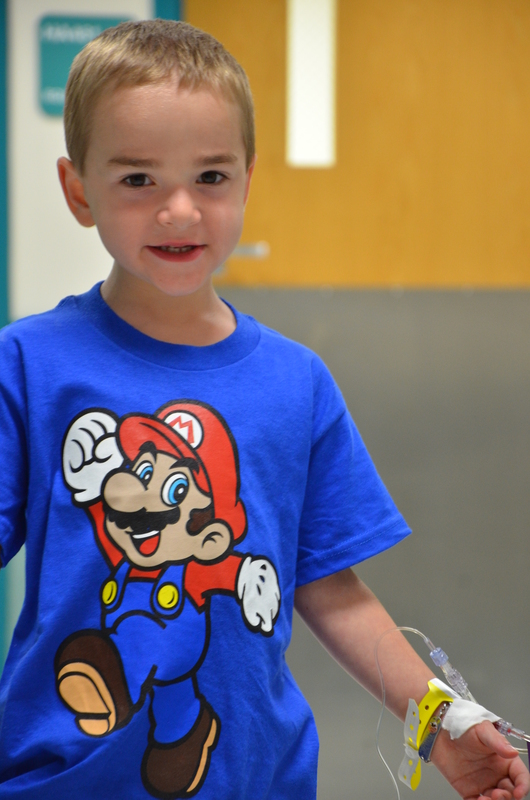 It wasn’t too much longer that his new pajama shirt was off and the Mario shirt was on. I told him no more presents until they did his iv. We took him into the procedure room to do his iv. As I mentioned before, that is not at the top of Wesley’s to do list… but it had to be done. I held him and he cried the whole time. Not much could distract him. Three nurses were there to help. It went in very good, and apparently they got a good vein because as soon as it went in, blood was shooting out everywhere! It was all over my leg and one of the nurses was down there washing my leg.. lol. I think at that point Wesley thought it was kind of funny, so he got better. His iv had a name. Charlie. Charlie was a girl. Wes hooked me up with an awesome necklace and bracelet out of the treasure box. He had to be premedicated before we could do the rituximab. This was to minimize any reactions that he could have. They gave him Tylenol, Solu-Medrol and Benadryl. We had to wait thirty minutes for that stuff to start doing it’s thing so we played in the playroom. 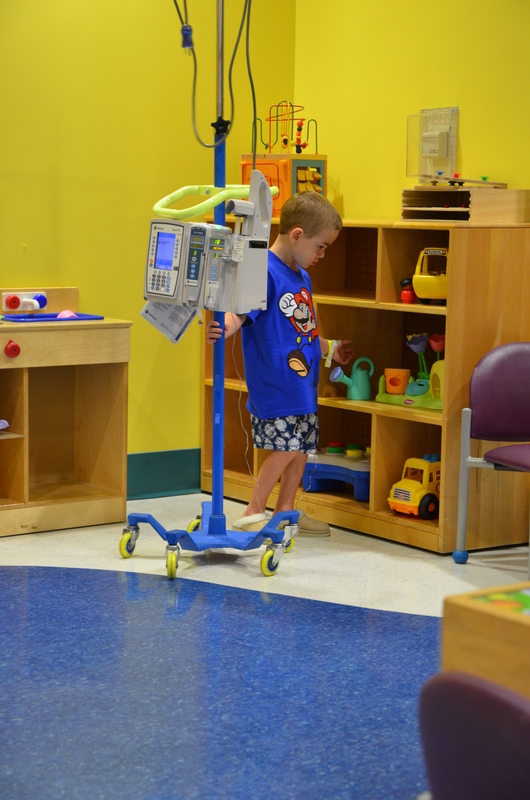 Wesley loved the playroom when we were there a year and a half ago. It was THE place to be. As soon as we got in there and looked around, he informed me that it was boring. So we checked out the library and he found a car and some books to read for later. He was much to big for the car, but he road it around all day anyway. 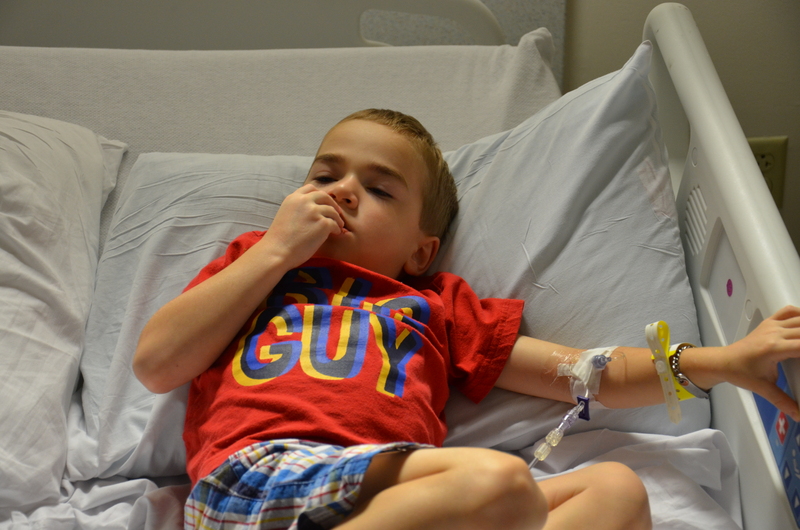 After thirty minutes was up, the rituximab had been delivered and was ready to be started. Oh, was that one of the scariest moments of my life. We hooked him up and stayed in the room after that. His blood pressure had to be monitored. We had to keep a good check on his temperature also as it could cause fever. We knew what could happen, but didn’t really know what to expect because every person reacts differently. After the first fifteen minutes, my heart was much more at ease. We were mostly past the part that he could experience anaphlylaxis. I let Wesley open his next present which was a couple of little Play Doh construction thingies. He really liked that. 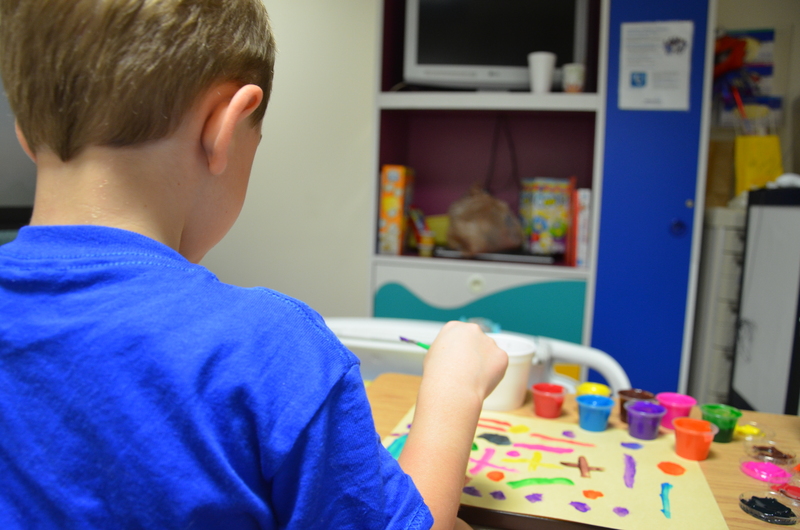 It kept him busy at the first of the infusion and it was something calm to do while we sat there. PBS Kids helped too! 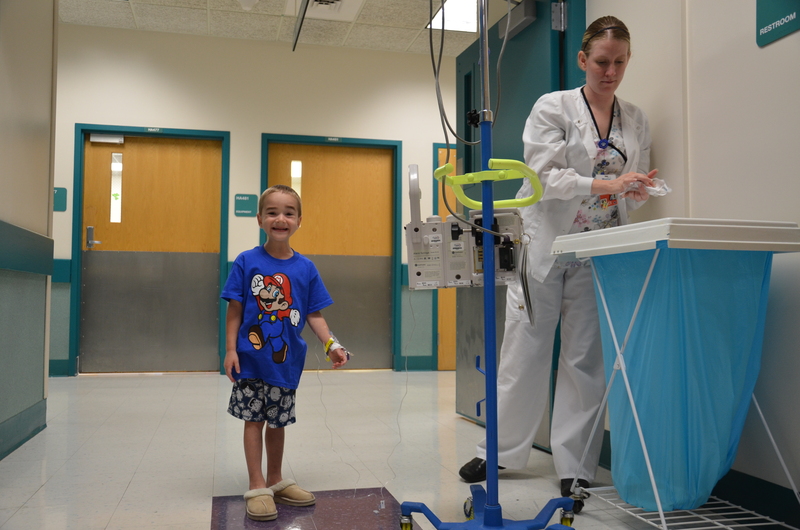 Each hour, as long as Wes had no reactions, the nurse was ordered to up the speed of the infusion. Each time, I panicked a little, but the kid never reacted and it went so much more smoothly that I would have imagined. We were moved into another room to spend the night. It was about dinner time when they moved us. Well, from past experience, I know that they are not capable of making my kid food that he can eat that won’t kill him. I brought food and Brad’s mom showed up with more food. I was in the room cutting broccoli up, peeling potatoes and shucking the corn! I don’t like using the microwave to cook, but it works in a pinch. I am sure it looked weird, but atleast my kid was safe. 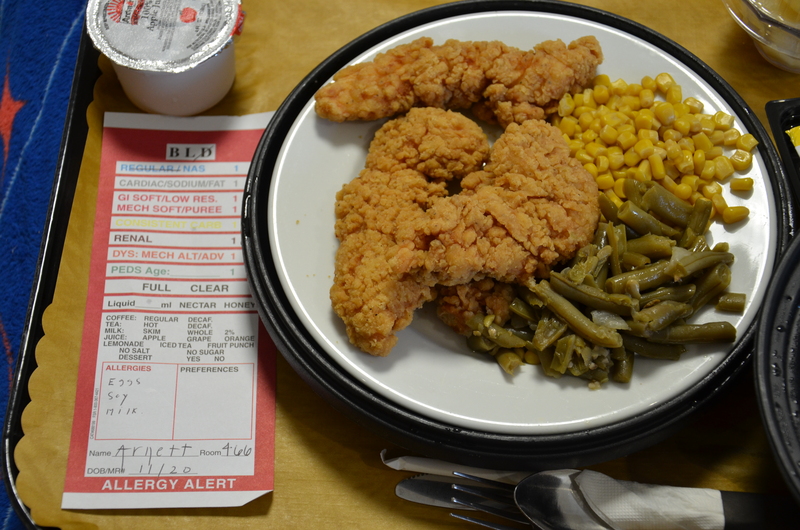 They brought up the plate that was supposed to be for Wes, it had the big red paper on the tray that said he was allergic to milk, soy and egg… right next to that paper was a plate full of breaded and fried chicken with green beans and corn. I would say that from the way it looked, that chicken was breaded with milk and egg, then fried in soy. The veggies also looked like they had oil on them. Ah, the frustrations of food allergies. I am still just appalled that a Children’s Hospital isn’t equipped to deal with serious food allergies. That is another story. It’s all good, cause Brad ate Wesley’s tray and Wes had fresh stuff that I fixed for him. There was plenty of Wesley friendly food that me and him shared. 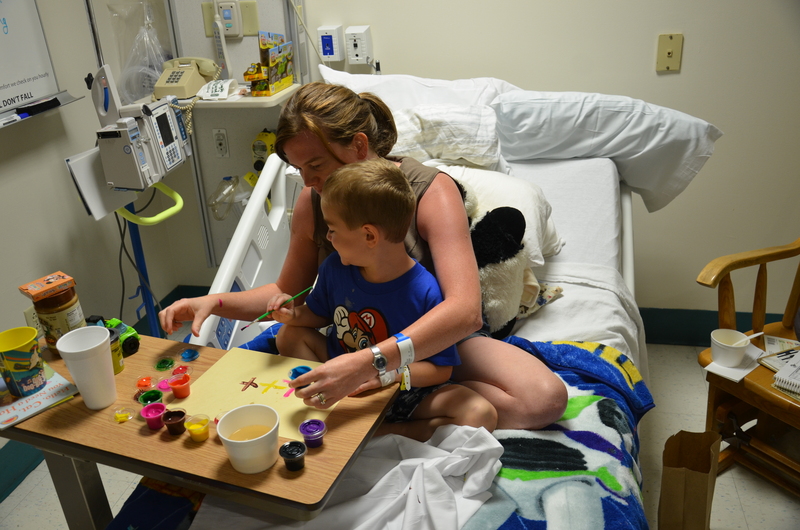 We stayed up and played Play Doh, painted and most notably, played Mario! Wesley has been banned since the end of July. I figured now was the best time to give it back to him! Then I popped some popcorn per Wesley’s request and we ate it before we went to sleep. We woke up and got out of there fast! Me and the boy slept all day after we got to the house! Here we are home sweet home in our own bed. So wonderful. Since Wesley’s body handled everything so well, we will go back up next Monday and do another infusion as an outpatient. It should only take about three hours and we will come home. 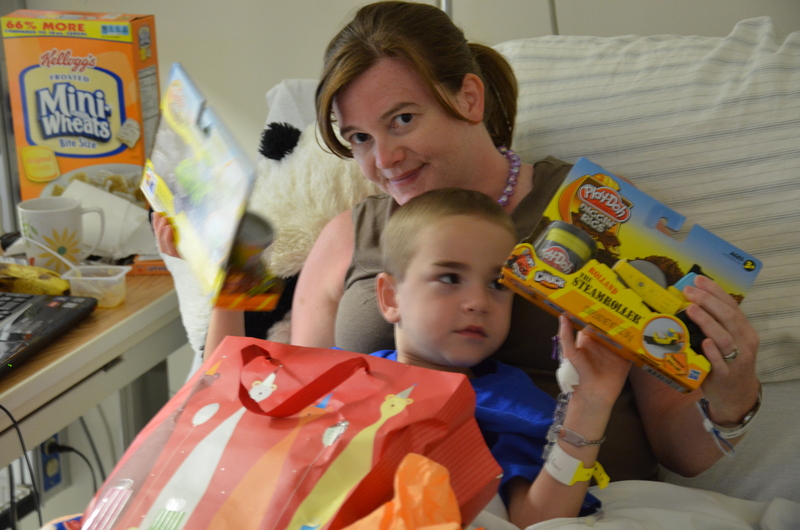 They will do blood work and as long as all the CD-19 cells are wiped out, he won’t need another infusion. If they aren’t, we will need to go back two more times, seven days apart. Wesley’s immune system is seriously suppressed now. The nephrologist told me that there have already been reports of the flu this early in the year. We were cautioned to keep Wesley out of all public places and away from anyone who has any sign of sickness. 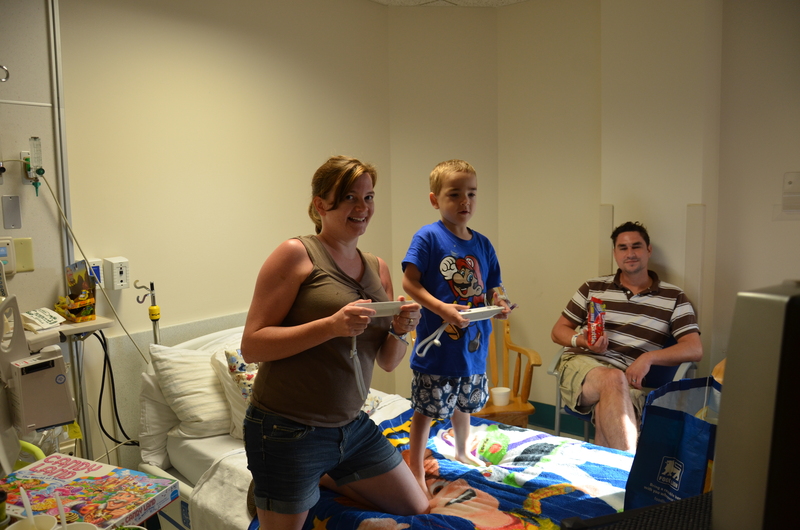 Last year, during the chemo, we did this. But that started close to December. This is only August! Seems like it will be a long time before Wesley will be able to do normal things again. It is so worth it to keep him healthy and out of the hospital.